It's murder most foul with Pastel Games' latest point-and-click mystery, Rizzoli & Isles: The Masterpiece Murders. Created for TNT's series of the same name, the first murder case you'll wind up trying to solve is anything but routine; people are dying, and when paintings showcasing the very crime scene you just entered begin to turn up, it becomes apparent that you're not dealing with your garden variety whack-job. Is Bob Ross striking back from beyond the grave? I never trusted that guy. Who knows how many happy little lumps were buried under those happy little trees? Analysis: Okay, so maybe murder isn't necessarily foul; visually, the game is as artistically striking as we've come to expect from Pastel Games, with great artwork that matches the overall theme and wonderfully detailed environments. The repetitive soundtrack does get a little old, but then that's what disabling the music via the options and playing Lady Gaga on loop is for. (Why, how do you get "in the zone"?) Considering that the game is based on a television drama, you might wish that the characters were more involved than relegated to what feel like walk-on roles, but hey... don't we all want to star in our own stories? Investigation, unfortunately, winds up feeling like it takes a bit more guesswork than anything else. You'll spend a lot of time blasting every surface you come across with blood stain spray, then trying to fingerprint everything, then trying to swab it, just in case you missed something. Since you actually play as neither of the two lead characters (I always dreamed of being Nameless Detective #41! ), it seems like allowing for an option to ask Rizzoli, who always seems to be hanging around the office, for a hint or a hunch would have been helpful. But, alas, if she doesn't have anything new to say, she just stares at you like your shirt is covered in day-old pizza sauce, leaving you to shuffle meekly back to your evidence board and bump papers together in the hopes of stumbling across a connection. As of this writing, there are also a few glitches to stumble across that might hinder your progress, which stinks since one of them (an apparently random "infinite tutorial loop") essentially forces you to reload the screen and lose your progress. Ultimately, however, if you stick with it and doggedly cover every scene for fingerprints, bloodstains, and belly-button lint, justice will prevail. The Masterpiece Murders isn't a particularly long game, but it's just the right size to fit a bit of prime-time mystery murderin' into your evening for those of us too lazy to do it ourselves. (Maaaaan, it's not my turn to do it this week! It's joye's turn!) If you enjoyed the Scene of the Crime series, you're definitely not going to want to miss this chance to gum up your shoes, as the pros say. That... is what the pros say, right? 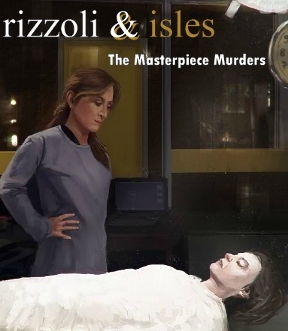 Rizzoli &amp; Isles: The Masterpiece Murders Walkthrough now available! Speak to the cop on the right on the starting screen. Enter the apartment (pink doorway). Examine the corpse in the window. Mouse over the neck wound to find out more about it. Use a cotton swab on it to collect a blood sample. Zoom in on the victim's hand. Use the fingerprint brush, then the tape, on it to collect samples. Use the fingerprint brush on the table near the red droplets. Nothing. Turn left. Zoom in on the painting. Looks familiar, eh? Mouse over it. Also, get a fingerprint from the left side of the frame (remember, brush, then tape). Enter the bathroom (door on the right). Zoom in on the tub. Spray the interior with the blood stain spray until you've got a good sample (look for it below and to the right of the faucet), then use the cotton swab to collect it. Go back as much as possible. Speak to the officer on the left. Go left, then forwards, then forwards again. There's nothing to see in the hallway. Speak to the landlord to get a drawing. You're done here! Go to Headquarters via the map. Zoom in on your desk (bottom of the screen). Not much to do here, so go back. Zoom in on the bulletin board. Not much to do here, either, so go back. Go right, then forwards to get into the autopsy room. Speak to the doctor, then return to the first view (the door's in front of you). Check your desk again. Pick up the pink report and the weapon sketch. Go to the board, and the new objects will automatically go up on it. Mouse over the pink report to find out about the Medical Center. You're done here for now. Go to the Medical Center. Speak to Rizzoli. Then go into the center (mouse over the sign). Go forwards (big doors), then approach and enter the door with the crime scene tape over it. The victim's in her chair. Approach her. Hm, deja vu. Get a blood sample from her neck. Back up, then click on the desk to the right of the victim. Take one of the pencils from the holder and use it on the notepad next to the schedule book. Take the scribbled page. Examine the schedule book. Mouse over the one message. You're done here. Return to headquarters. You've got three pink reports on your desk now. Take them all, then stick them on the board. Combine Painting #1 with Painting #2. Combine the picture of Julia Harris with the picture of Dr. Harris. Combine Julia's blood sample with the report of the blood sample from the bathtub. Back away. Go left and talk to Rizzoli. Alright, you're off again, to Heragon this time! Go inside Heragon and talk to the owner. That was easy. Return to HQ. Check your desk. Two things are there, so pick them up and add them to the board. Combine Rizzoli's note with the yellow post-it, then combine both with the list of oil paint buyers. That was easy! Head to the Free Art School. Go inside and talk to the receptionist. Then go past her. Go into the auditorium (double doors on the left). Pick up the lockpick from one of the easels, then leave (the door's in front of you). Advance on the director's door (on the right). Zoom in on the doorknob and use the lockpick on it. Inside, take the key from the shelf towards the left and use it on the file cabinet. Take the employee list from it. Take the pill bottle from the desk. You should be done here now. Return to HQ. What are you doing in the Autopsy Room? Oh well, speak to Isles and get her note. Return to your desk like usual. Fingerprint the pill bottle, then hit the board for more deductions. Combine Dr. Isles's note with the medical receipt (remember the pencil scribble?). Then add in the toxicology report. Well done, new unlocked location! Head to Thompson's home. Go inside Thompson's house and head straight to the back room. Deja vu all over again. Zoom in on Thompson's body. Don't worry about blood samples this time. Back away. Zoom in on the painting. Take the spatula from the easel. Looks a lot like that murder weapon sketch, doesn't it? Check out the bag on the sofa. Get the dismissal paper from it. Done! Head back to HQ one last time. Check the desk. Fingerprint the spatula, then go to the board. Add Mr. Thompson's picture to those of the Harris sisters, and the new painting to the other two paintings. Combine the fingerprints from the spatula and the vial. Mouse over the dismissal. Adam Burns? A.B.? Those initials! Aha! Combine the dismissal with the logo the landlord drew for you a while back, then add in the Free Art School employee list. You're on a roll now! 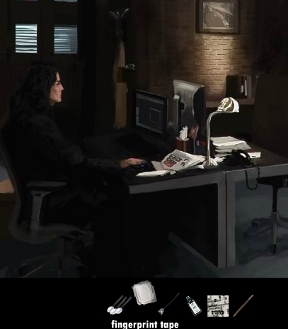 Go to Rizzoli's desk (left from this view), then use the pencil on the conspicuous piece of paper. Go find Adam Burns on your map and open the door, then watch the cutscene. Mystery solved! Hmm, I think I found out something earlier than I was supposed to my first time through as I didn't have all the evidence together at the time. It involves the pencil, which I missed the first time through the location I found it in. I can't leave because I'm missing something. Yeah the pencil thing was kind of annoying, since there were three things you should of been able to use it with. Also, does anyone else think that Pastel Games overuses the sounds for their buttons? the spatula from Thompson's house. I was there, saw the painting, did not get the spatula, and can't get it on return visits. 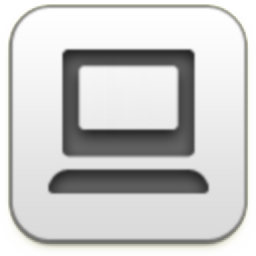 From the view of the victim, click on a new view. There should be a painting. Anything worth collecting? Left side of the frame, fingerprint. AAAHHHH! A murder mystery! I'm so excited for this. For this you will need the pencil. After you get it, wait for your boss to leave, select the pencil from the inventory, and start clicking on her desk. I'm not sure how much of the game you have to complete before she leaves her desk, but I managed to skip an entire crime scene. I know which art school I should go to (both from the notebook and the results of my boss's inquiry), but for some reason it won't appear on my map. I'm probably missing something, although I already know I have to go there. Short but great casual fun. This seems kind of petty but it's just so constant: the footsteps sound effect sounds like a static crack. I keep thinking the music is breaking up on me like a bad recording. Other than that it's great! Somewhat fun, but a bit lacking in atmosphere. If you exploit the bug bioLarzen mentions to unlock the final location ahead of time, but then proceed through the normal steps of the game anyway, you'll get stuck because the game expects you to unlock the final location again, but you no longer have the item you need to do it! So the woman who's your boss had the guy's name all along and you had to steal a pencil from the art school because you had no pencil? I have already been to the 3rd crime scene, but I have no painting #2 from the 2nd crime scene; anyone know where it is? @JIGuest: LOL :). Seems strange, doesn't it? I think this is some of PastelGames's best work. I like it almost as much as Aurora, which is my favorite. Great job, PastelGames! "it seems like allowing for an option to ask Rizzoli, who always seems to be hanging around the office, for a hint or a hunch would have been helpful. But, alas, if she doesn't have anything new to say, she just stares at you like your shirt is covered in day-old pizza sauce, leaving you to shuffle meekly back to your evidence board and bump papers together in the hopes of stumbling across a connection." - YES! Not only was this hilarious, it is absolutely true. That face they gave Rizzoli is priceless. She looks so annoyed with you, and it made me feel totally sheepish every time I tried to talk to her and she had nothing new to say. Ah well. Still a fun little game, though. Maybe I'm just being dense but I'm not getting a Painting #2 at all? Is this a bug or am I not doing something right? I've done everything else up to this point and even replayed it just to make sure and while I do get Painting #1, I'm not seeing Painting #2 at all. Yeah, same here, nothing on the wall. The only painting I had found was on the first murder scene. Unfortunately, I think I need it in order to proceed as I can't seem to do some of the last steps in the HQ. It really must be a bug. Can someone tell me where it's supposed to be?? I can't find the yellow post it note the second time at headquarters!! where is it? Not bad, but found this a bit disappointing for a Pastel game, actually. It was a little too rote, by the numbers. With little investment in the story or characters. Looks great, but certainly no Fog Fall or Covert Front. I'm @ the point where you put the pencil on the paper, but it's not going through. I'm doing this on iPad, though, so any ideas are welcome. There's definitely a bug. I can't find the second painting either. There are no paintings on the walls in the room with the second corpse, and I'm unable to finish the game without it. after you go to heragon and get the list im stuck and have no where else to go any hints??? Painting #2 is on the back wall of the 2nd crime screen. If you want to play the whole game bug free, you can find it at TNT.com. where do you find painting two? what conspicuous piece of paper??? me too, I don't find the "conspicuous piece of paper"
I can't find the conspicuous piece of paper either what the......? I have looked everywhere. I've been to the 2nd crime scene a dozen times and painting #2 is not on the back wall. Is there a work-around? ok...I don't know where and/or what the "dismissal" is. can someone please tell me what its talking about? In the first scene there's a fingerprint that you need to take off the frame of the painting in the living room type area. WOH!!! finly finished it it took me hell of a time but it was amazing tho :D !! @britni: It looks like it might be missing from the walkthrough. in the medical center on the wall behind the victim. No, actually painting #2 is missing due to a bug in some files of this game. I have yet to find one which works, actually. You can only find painting 2 at the first time you go to the medical center. If you dont look at it and leave the painting disappears with the body. I cant get the damn free art school to come up either. How did you get it to come up? I think I have done everything before that. i don't get the instruction:"use the pencil on the conspicuous piece of paper"
i cant find the "conspicuous piece of paper"
Okay.... am I missing something here? When I find the #2 Painting, I can't go to Thompson's house, but when I don't find the painting, I can go...? The second painting can be found in the hospital where the original murder victim's sister is found dead. It's hanging on the wall above her desk, I believe. Ah! I'm stuck :( I've been to the school and have collected all evidence so far (I've checked the guide, too). Still, it won't let me combine the Dr.'s note with the toxicology report. It won't let me combine it with ANYTHING!! The walkthrough mentioned something about a pencil scribble? I've tried using the pencil on every dang piece of evidence I've got. I don't understand TT_TT help! You first need to combine Dr. Isles's note with the medical receipt - Toxcidum x2 before trying to combine it with the toxicology report. The "scribble" is referring to Step 6 in in the Medical Center section of the walkthrough, where you use the pencil on the notepad to find the medical receipt. Unfortunately it is possible to do things in the wrong order, which is a real show-stopper. If you are missing the second painting, it is in the doctor's office, but you must find it while the body is still there. If you leave to the HQs without finding the picture first, it will disappear and you would have to start the game from the beginning.